Here’s a universal-mounting, two-gun rack that puts your favorite rifle or shotgun at your fingertips as you cruise your hunting property. 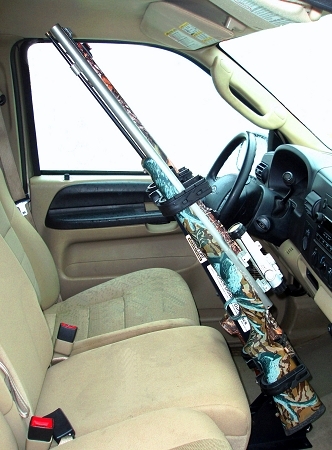 The Quick-Draw Gun Holder fits in most pickup trucks, mounts in a “stand alone” fashion and can be positioned to your preferred angle for quick access and maximum use of passenger space. The Quick-Draw holds two guns (rifle, shotgun or muzzle loader) securely and protected in a soft, cushioned cradle. Unlike conventional clips and loops, Great Day’s unique Velcro straps form and fit the super-soft holding cradles to the exact size of the stock or forearm of the gun it is holding - no more loose fits to disturb the sight and scope settings! The Quick-Draw and Adapter Plate set comes complete with all necessary hardware for quick and easy installation. Note: The Quick-Draw Gun Rack and the Adapter Plate can be purchased separately.